(Dallas, Texas) – Fifteen $20 Federal Reserve Notes from the infamous 1971 “D. B. Cooper” skyjacking will be offered to the public for the first time in June by Heritage Auction Galleries of Dallas, Texas (www.HA.com). The notes are owned by Brian Ingram, 36, of Mena, Arkansas who was eight years old in 1980 when he found the only ransom money ever discovered from the still-unsolved skyjacking. 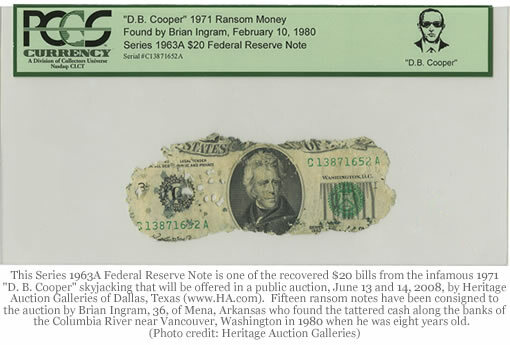 “Some of these notes have the initials of investigators who examined the recovered money after Ingram found it along the banks of the Columbia River near Vancouver, Washington in February 1980,” said Steve Ivy, Co-Chairman of Heritage and a long-time paper money collector. The D.B. Cooper cash will be offered as part of a big auction of Americana memorabilia in Dallas and online, June 13 and 14. “As a collectible, these notes cross several lines of interest. Of course, they appeal to many currency collectors, but they also have great appeal to people who enjoy general Americana and popular culture items as well as those who collect ‘outlaw’ items, an area that has a big following,” said Ivy. Ingram said the money almost didn’t survive its discovery. Ingram found approximately $5,800 of the $200,000 ransom given to the skyjacker, and the FBI later returned a small portion to his family. Ingram owns 84 D.B. Cooper bills and fragments that were authenticated by PCGS Currency in February and encapsulated in specially-labeled protective, archival storage holders. The labels have the FBI’s 1971 artist’s sketch of the sunglasses-wearing skyjacking suspect who has still not been found. Anyone with information about the skyjacking is encouraged to contact the FBI’s Seattle office by e-mail at fbise@leo.gov. Additional information about the auction will be available from Heritage Auction Galleries, online at www.HA.com, and by phone at (800) 872-6467.